Egg loves Bacon. Lettuce loves Bacon. Waffle loves Bacon. 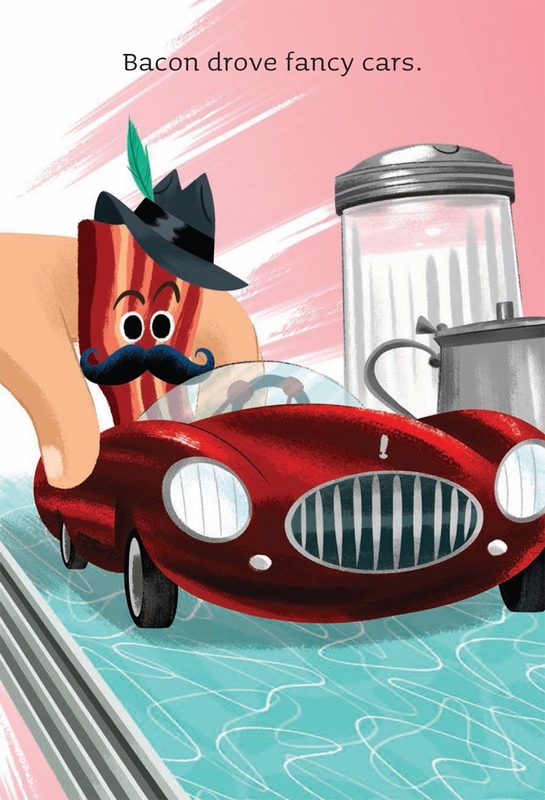 Bacon is sizzling with popularity. And pretty much everyone thinks he is the best. That is—until Bacon's fame goes to his head. He's so busy soaking up the attention, that he soon forgets the important things in life, like friendship and family. How will it all pan out for our dashing, delicious hero? It's true, I love bacon. So it almost goes without saying that I thought this book was absolutely fabulous. 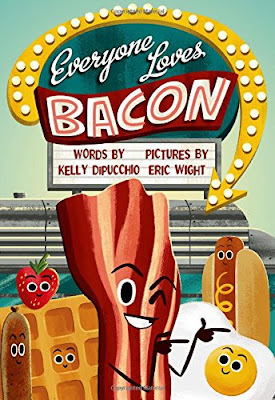 Not only does it capitalize on the best breakfast meat ever, but it does actually teach a good message about friendship. The story itself is pretty short and to the point, and filled with little puns and jokes along the way. I did laugh repeatedly, which is always a big plus in my book. The illustrations are also fabulous—full, vivid spreads that show all the glories of bacon. Basically, in conjunction with Lady Pancake & Sir French Toast, you're on your way to a breakfast-filled, fun storytime all about the importance of friendship. Now, does it have quite the happy, lets-have-these-friends-make-up ending? Well, no. But it will have you craving bacon. But tell me this: why does this single illustration have a human hand? Seriously, the only page. Everywhere else, the food is moving on its own. What does it all mean? ?